To get ready for my Jazz Fe(a)st bachelor party in New Orleans, I did what any normal person would do. I scouted restaurants during a work trip to the city six months ahead of time. 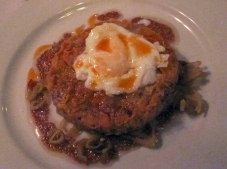 I learned how to make smoked ham with tasso spice and created a dish I called Pig Foot Jambalaya. I discovered that some of my far-removed ancestors helped settle Acadia Parish, the home of Cajun food and culture. I hounded legendary Big Easy chef Donald Link for an interview for my two-bit blog. I listened to The Meters on repeat and pretended I was playing in my high school battle of the bands in 1997. And I meditated on the sheer test of gastrointestinal will that was in store. New Orleans was already my favorite food city before my first trip to Jazz Fe(a)st for the bachelor fete. When the obituaries were being written on my stomach lining and liver at the end of the weekend, I was pretty sure that Jean-Baptiste Le Moyne de Bienville founded the city in 1718 because he foresaw one man’s unique pork and shellfish needs in a distant future. Taken together, the below food stops represent the outer limit of what I’m capable of — gastronomically and emotionally — in a three-day span. A companion piece on the food of Jazz Fe(a)st will soon be at www.hypervocal.com/samsgoodmeats. Breathe with me. 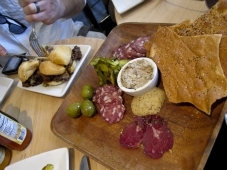 There may not be another reputable food city in the world where a butcher shop blows almost all other eating options out of the water, but the small plates and sandwiches Cochon Butcher serves are that good. I say that knowing full well that I’m writing about another Link Restaurant Group outpost two paragraphs down. My favorites are the rich boudin with tangy mustard, the funky duck pastrami sliders, the smokey bacon melt, the rillette and head cheese, and the sweet BBQ pork sandwich. If you’re into fresh cuts and top-flight cured stuff, they got that too. Authentic enough for you? Ok, fine. 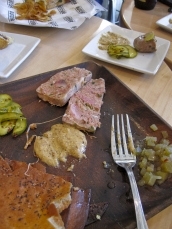 Check out the farms that provide Cochon Butcher with high quality local products. It’s hard to say no when Scott Stegen, founder of Italian fine foods importer Sausage Debauchery, implores you to visit a restaurant because of its in-house charcuterie operation. 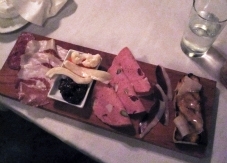 That’s how I found myself at A Mano, one of Chef Adolfo Garcia’s four Italian restaurants in New Orleans, where salumiero Kris Doll (@boristhebutcher) served us a delicious tasting plate for the special Big Easy meal between a late afternoon lunch and an early evening dinner. Upon trying the buttery rabbit liver pate, my brother and I looked at each other and knew without saying anything that it tasted just like the stuff Dad used to make in his little earthenware jar. The gamey duck prosciutto was also excellent, but the Frisbee-sized piece of fried headcheese with a yard egg and chimichurri sauce stole the show. For our third Tchoupitoulas Street meal in five hours, we hit Cochon, Chef Donald Link’s unabashed homage to Cajun country food (and newly minted James Beard awardwinner). 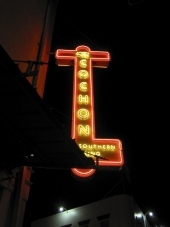 Announced by a blazing neon sign and always filled to the brim, the restaurant properly lubricates patrons with delicious drinks (Old Fashioned for me) and local beers before serving dishes that reflect the chef’s deep connection to his Acadian heritage. The wood-fired oysters were perfectly cooked, retaining a hint of their raw brininess in a hot shell. The chicken and andouille gumbo was what it should be, rich and smoky without embellishment. The Louisiana cochon de lait cake (wood-roasted suckling pig) impressed on a bed of turnips and cabbage. 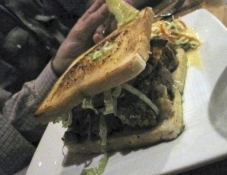 A mountainous fried oyster and bacon sandwich was tear-inducingly good. And my classic stewed rabbit and dumplings was over-the-top rich. My dad and brother pushed me home in a borrowed wheelbarrow. What could be better for breakfast on a hungover morning than two pieces of bread floating in a lake of roast beef bits that were fished out of the pan juices after a long oven session? Perhaps a fluffy biscuit with fresh blackened ham and egg, but no need to belabor the point when you ordered both. 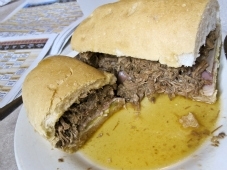 The roast beef “debris” is Mother’s signature dish, with the ham a close second. I also had one of the best fried oyster plates I’d ever eaten on a past trip to the restaurant, but this time around, we got there before the fryers had even been turned on. Don’t miss the chance to chat with Joe Cahn, the NFL’s Commissioner of Tailgating, who swears he commutes from Houston but seems to live in the restaurant. 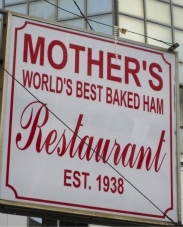 To read Daily Meal editor Jeff Zalaznick’s write-up of Mother’s, click here.